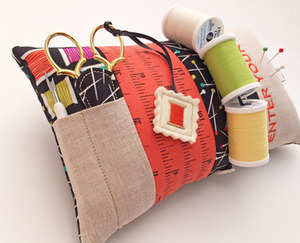 Our exclusive Sewing Center set is perfect for travel, classes, gifts for stitching friends, etc. 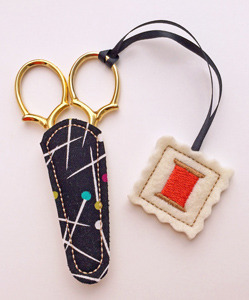 Our exclusive sewing set is perfect for travel, classes, gifting, etc. 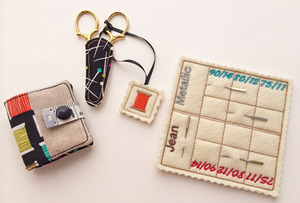 Each item is made in your embroidery hoop. 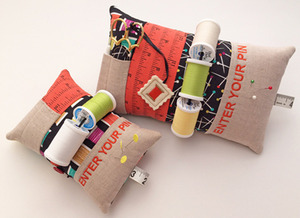 The Sewing Center is included in both a 5x7 & 6x10 version. Ever use a special needle for a project, then change back for regular embroidery only to forget what size or type that needle was? Our handy Needle Organizer will help you keep track of ballpoints, sharps and other specialty needles for your embroidery or sewing machine. It also holds spools of thread that are usable and removable. It's a pincushion too. For detail, we added a hanging loop made from an old tape measure. You could use ribbon. 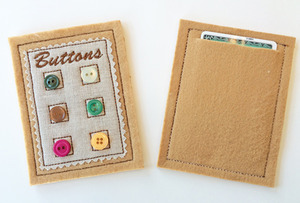 Our Button Card design can be used as a gift card holder. It would make a great gift with sewn on, usable antique buttons. 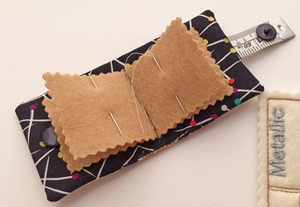 Keep up with your hand sewing needles easily with the cute case. We used the end of an old tape measure for the closure for that special added detail. You could use ribbon. Here's a photo of the needle case open. You do need to use a sewing machine to stitch down the felt pages, but it's super easy and takes less than a minute. There are a lot of great designs included in this fun, functional set.